So, did you know that shortly after Ronald Reagan became Governor of California in 1967, he began eating pectin jelly beans to help him quit smoking. When a new brand of jelly beans, called Jelly Belly beans, appeared on the market in 1976, he quickly switched to them and would often enthusiastically share them with his Cabinet, staff, and visiting officials. Reagan enjoyed these sweet little treats SO much that he later sent a letter to the chief executive of the company that produced them, stating, "we can hardly start a meeting or make a decision without passing around the jar of jelly beans." 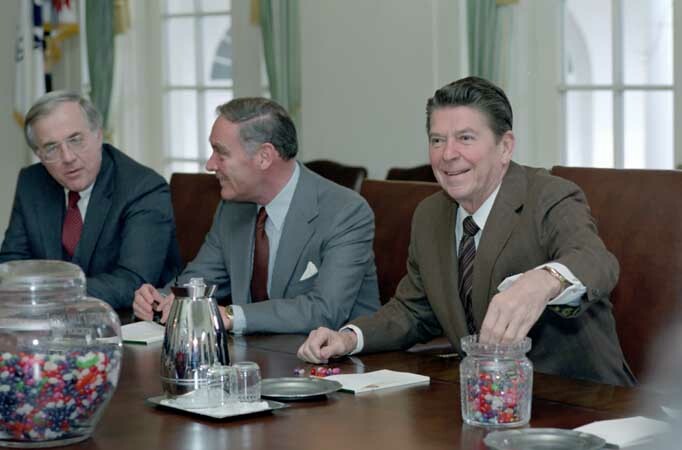 Even after he became president, Reagan's fondness for Jelly Bellies didn't diminish, and large colorful jars of them were often prominently displayed on his desk in the Oval Office, in the Cabinet Room, and even on Air Force One!! Since then, there have been hundreds of official flavors to choose from, including Bubble Gum, Buttered Popcorn, Cappuccino, Caramel Corn, Chili Mango, Chocolate Pudding, Cotton Candy, Green Apple, Kiwi, Juicy Pear, Lemon Drop, Margarita, Orange Sherbet, Piña Colada, Pomegranate, Raspberry, Sizzling Cinnamon, Strawberry Cheesecake, Toasted Marshmallow, Top Banana, Tutti-Fruitti, Very Cherry, Wild Blackberry, and Watermelon. FAST FACT: In addition to official flavors, the Jelly Belly Company produces "rookie" flavors that might be added to the roster if they become popular enough. Some somewhat curious and, um, questionable flavors have included Baked Bean, Bloody Mary, Buttered Toast and...Roasted Garlic. Ummm, no thanks! !